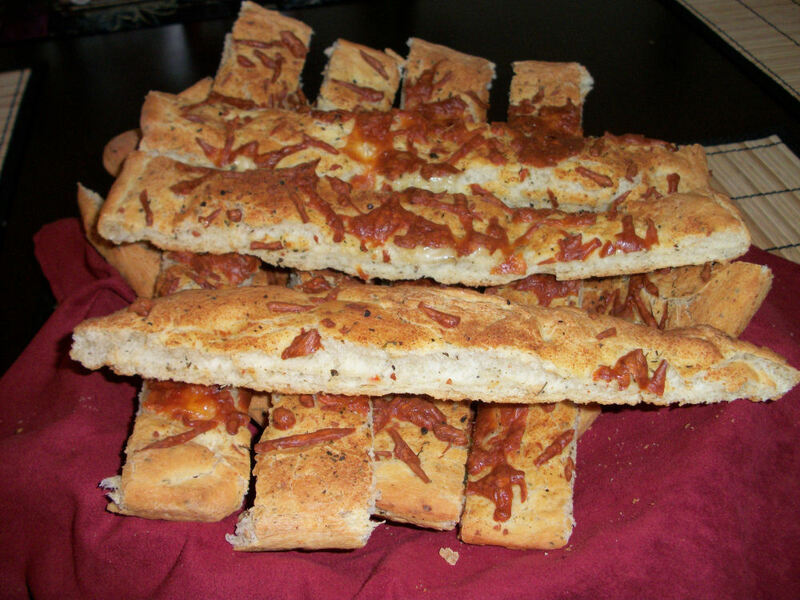 Focaccia is so easy to make, I can’t understand why most folks bother to buy it in a store. You can so easily whip one together and top it with anything you like! No need to get that same old olive focaccia or rosemary focaccia if you can even find it. Go nuts! My favourite version currently involves either just cheese or cheese and garlic. So naughty seeming but really not all that bad. All about portion size. I love to cut these into sticks and have them ready to snack or dip while watching a marathon of movies or rocking out with rockband (three is coming out in late october eeee!). Combine everything except the last three ingredients in either a bread machine or by hand. Allow to proof. Grease a baking sheet, pat dough into the pan (rectangle shape). Spray with cooking spray. Sprinkle cheeses on top. Bake for 15 minutes. Allow to cool for a few minutes. Slice into 12 sticks. Makes 12 servings. Each serving is 124 calories, 1.6 grams of fat and 1 gram of fibre. These are pretty big sticks of focaccia! Whether they are a side dish or a snack they are definitely a handy bread to have around. Yes, they do share well. This entry was posted in Sidedish, Snack and tagged Bread, Cheese. Bookmark the permalink.